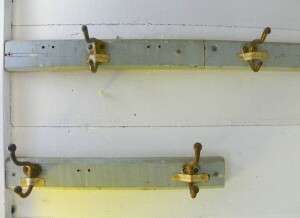 School house coat hooks still labeled with student names. Noel Marine Supplies & Firearms was originally located in the old Wyman school house. The two-room school house was eventually abandoned when a new town school was built in Milbridge. Little has changed about the historic building. 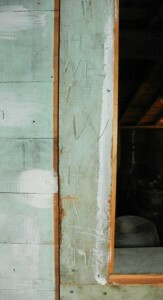 Its original wood construction still has many of the school house features including: several slate chalkboards, coat hooks complete with children’s names who last attended the school. The walls are adorned with antiques from tools to fishing equipment that always seem to peak curiosity. While the antiques are not for sale, if you enjoy a bit of nostalgia, it is worth the trip to check us out. The property also includes the original two-seat outhouse, which is now only a conversation piece, and name carvings in some of the wood! School house graffici circa 1950. At the original Noel Marine Supplies and Firearms we tried to mix modern technology into the daily operation of business without compromising the original integrity of the historic building which served us well for 12 years. The marine part of this business was started in January 2000 with just a handful of marine supplies. Over the years Noel Marine Supplies has expanded and in 2013 we built a modern facility on Route 1 where we are currently located. We are well stocked with an ever expanding line of commercial fishing supplies, firearms & ammo. Noel Firearms was added in July 2002. We offer long guns, handguns and a large selection of Winchester, Remington, Hornady and Federal ammunition. We sell both new and used firearms and buy guns outright or in trade.